It's time for me to review another book published by Master Books. This time, it is Meet the Skeptic, a fairly quick-to-read 144 page paperback book written by Bill Foster. Christian faith almost always meets skepticism. Are you equipped to effectively handle the skeptic’s questions and debates? Develop an understanding of the skeptics ideas and better fulfill the Great Commission. This easy to read approach to apologetics and evangelism is a field guide to faith conversations. It is written for teens, college students, and adults and can be used as a group study with the leader’s guide and workbook. I'll confess my thought when I saw this was, well, a bit skeptical. There are so many titles out there already relating to apologetics and answering objections from skeptics. Do we really need yet another one? Well yes. Yes, we do. 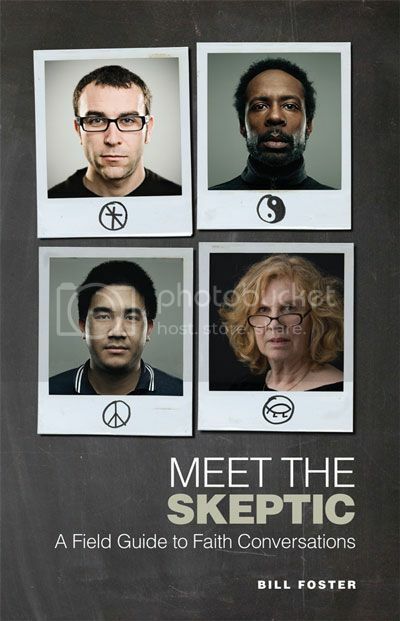 Meet the Skeptic is different. Foster is just so real. He uses lots of very down-to-earth illustrations, and encourages people to understand what their "Christian jargon" means to skeptics. I was liking the book, until I got to the final chapters. Then I was loving it. The Scientific Skepticism chapters are phenomenal. I notice whenever evolution comes up, people try to insist that evolutionary theory relates to other meanings of the word "evolution" (such as changes over time, or adaptations within a species). I get so frustrated when talking to people who try to use an everyday meaning of the word evolution to "prove" the theory, not even realizing that the theory states that all life comes from a rock, or goo, or some other inorganic form. Defining terms is so important. Fabulous book. I highly recommend it. Disclaimer: I received these books for free from New Leaf Publishing Group. No other compensation was received. The fact that I received a complimentary product does not guarantee a favorable review.